Ningbo Chinsunboard Building Material Technology Co.,Ltd based in China and has been established for over 15 years and is one of the biggest manufacturers of fiber cement board, magnesium oxide board, Calcium Silicate Board with Professional Manufacturing Experience, Excellent Research and Development Team and Extreme Quality Control Team under the trademark Chinsunboard. Chinsun Calcium Silicate Board is the good choice for building board applications such as wall partitioning, wall cladding and decorative walling. Chinsun Calcium Silicate Board can be applied to residential, commercial and industrial buildings, schools and hospitals etc, especially is suitable for where speedy construction, cleanliness and hygiene is of high importance. It's lghter than fiber cement board but also strong and flexible. As we control our quality and stability of products strictly with ISO9001 International Quality Control System and provide professional solution for various requirements from different customers, our Calcium Silicate Board is quite popular in the international market. We got numerous of inquiries from our clients every day. Today we would like to share some with you. 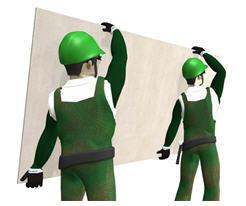 Message: We are looking for a supplier of Calcium Silicate Board in 1200mm * 2400mm. We need three kinds of Thinkness molds, 4mm, 6mm and 8mm. Please give information on Edge Porfile: Square-cut edge or Recessed edge, and quote on them separately. We hope that you can help us. Thanks! Message: Hello This is Monica from N**** (Korea) I would like to get some samples (Calcium Silicate Board) Please send me back email what I write down. Thank you! Message: Thanks for your quick and safe shipping! We have received your Calcium Silicate Board yesterday. We are glad to find that your Calcium Silicate Board are really professionally made, they are in good quality. Thanks so much! Looking forward to the next cooperation! Message: Hello, we have used your Calcium Silicate Board, they are perfect to our requirements! And we would like to order more, please quote on larger quantities for us to choose and more products list as well.